Essie Professional has better brush and a longer lasting nail polish. We have the last stock available of the professional range and iit's going very quickly. Essie nails offers more than 250 colour shades and the collection keeps on growing, with Award Winning no chip formulas and long lasting coverage. With an extensive range of nail polishes, nail treatments, nourishing base coats, shiny fast drying top coats and other professional quality products to enrich, correct, protect and strengthen nails for perfect results. An elegant and sheer sandy grey. Please note: Essie nail varnishes cannot be exchanged or returned. Knock them down with a feathery touch of dazzling platinum silvers and shattering cobalt blue. Instantly transform your nail colour from a high gloss shine to sophisticated matte in seconds. A must have blue black, cool academy chic for any season. The perfect colour for fall and looks good on every skin tone, a fun and adventurous plum nail polish. Please note: the Essie nail varnishes cannot be exchanged or returned. Slip on this silky sari pink at a monsoon wedding, twirling during a delhi dance like a Bollywood superstar. Please note: cannot be exchanged or returned or shipped overseas. When you are with this energetic Goa blue, sleep has nothing to do with it. Make your manicure a little bit mischievous with a mix of gunmetal and rose gold confetti. A deep purple colour, with a slight shimmer. Please note: Essie nail colours cannot be exchanged or returned. 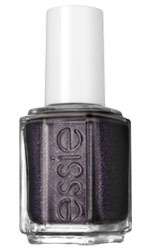 Essie Decadent Diva, a daring dark brown with a hint of bronze shimmer. Essie Fishnet Stockings professional nail polish is a dark red colour to spice up those nails. A fiery tango red with dark undertones, very sophisticated. An indulgent jet black nail polish with fine amethyst glitter, take the plunge. A smooth shimmering cafe cream polish with a satin finish. This delicious fondant icing colour is the new must have shade for the festive season. A beautiful turquoise with a tiny sprinkle of fine silver glitter, shimmer like a mermaid. The Essie brand was formulated 25 years ago in NY by Essie Weingarten and has become one of the most successful nail care Companies in the world. Essie, the ultimate colour authority, offers a line of superior nail care products with an exclusive award winning formula. Essie’s fashion-forward colours are always chic and elegant and can be worn ‘from the bedroom, to the boardroom, to the ballroom.’ Always inspired by the runways of Paris, Milan, London and New York, Essie colours are recognised worldwide because they are chip resistant, long lasting, and provide flawless coverage. Today, Essie offers more than just nail polish; the collection has an abundance of total treatments for hands and feet and Essie has become the brand most trusted by beauty professionals, fashionista’s and celebrities alike. The Essie brand was formulated 25 years ago in NY by Essie Weingarten and has become one of the most successful nail care Companies in the world. Essie, the ultimate colour authority, offers a line of superior nail care products with an exclusive award winning formula. Essie’s fashion-forward colours are always chic and elegant and can be worn ‘from the bedroom, to the boardroom, to the ballroom.’ Always inspired by the runways of Paris, Milan, London and New York, Essie colours are recognised worldwide because they are chip resistant, long lasting, and provide flawless coverage. In 1981 Essie Weingarten established Essie Cosmetics. As a child she was fascinated by nail polish, and at the age of 12 she had her first manicure. "I think I was my nail technician's youngest client ever, and nail lacquer has been my obsession ever since," confides the always candid Essie. Driven by her passion and her innate ability to key in on the hottest shades, Essie Weingarten and her partner Max Sortino created a wildly successful nail care empire. In the footsteps of cosmetic giants before her Essie created her line slowly, starting with just 12 shades and 3 nail treatments. Essie thought Vegas would be the perfect place to launch her products. "After all, the people who work in Vegas - the showgirls, dancers, dealers - needed to take care of their hands and look good for their jobs," she says. Today, 4 of the original 12 colours are still hot sellers including: Baby's Breath, Blanc, and Bordeaux. When Essie returned to New York, the phones started ringing and orders started pouring in. Beauty professionals quickly found Essie's chip-resistant formula, outstanding durability and fashion forward colour selection far superior to anything else on the market. Soon, top nail techs, models, editors, and celebrities such as Madonna, Sharon Stone, and Cindy Crawford were among Essie's biggest fans. All were drawn to the line's exceptional quality and whimsical shade names. Ballet Slippers (designated a "classic" by beauty industry insiders), Mademoiselle, and A-List are amongst Essie's most popular award-winning shades. Essie introduces 4 new collections a year seasonally and the line includes over 200 shades. What do you have in common with Madonna, Sharon Stone and Cindy Crawford? Yes, you are beautiful and you have discriminating taste in your nail colour. 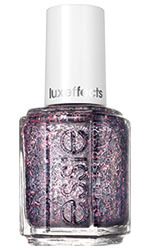 Essie is the name behind the nails and when the A-Lister's need to look their best, Essie is what they use. For over 25 years, Essie has been the beauty industry's leading authority on nail care and colour. From humble beginnings of 12 colours, the rainbow Essie now offers has grown to more than 200 of the hottest shades with the most memorable names. And Essie doesn't stop at just nail colour; there is a complete line of professional nail care products that help promote health and beauty for every hand they touch. Need some fresh ideas in nail colour combinations for that hot date or important interview? Let the Queen of Polish be your guide to the perfect manicure and pedicure with these sensational colour innovations. Mix and match to create your own personal look. Help! I just cracked a nail and can't get to a salon. What can I do? It's always sad when you have ten perfect nails and one starts to break. Here's what you can do to save that nail and prevent it from breaking further. Cut a small strip from an unused tea bag and cover the break using Essie's '3-way glaze' or nail glue if you have some. The '3-way glaze' will glue the tea bag fabric over the nail and act as an instant patch. Add the topcoat and voila! Your nail will be as good as new. Ouch! I just got a horrific paper cut on my index finger that really smarts. What can I do? You can place a small drop of base or topcoat to seal the cut. It will sting a little when first applied, but after the cut has been sealed, it won't hurt anymore! I got my nails done five days ago and they are starting to look dull. I can't get to a salon for a fresh manicure. What can I do to get that 'just back from the salon' shine? Although our topcoat is strong, durable and lasts for up to a week, everyday tasks like gardening or washing dishes can wear away the topcoat leaving nails looking dull. Refresh that mani with 'shine-e', the nail solution that restores shine and helps prolong the life of your nail colour. My cuticles get so dry between manicures and I am especially prone to hang nails. Do you have a product that can help me? Our hands are always exposed to the outside world and nails and cuticles can suffer, especially in winter. Try our 'apricot cuticle oil'. Its gentle, natural oils moisturise dry cuticles and also helps prevent hang- nails. Apply just before bedtime so those helpful oils can do their magic overnight. Use 'apricot cuticle oil' on your toes too to keep those cuticles soft and manageable. Another secret is to place some' apricot cuticle oil' underneath nails to add needed moisturising agents especially during those drying winter months. Travelling? Take our 'cuticle pen' with you. Its small compact size will fit in your cosmetic bag and can even be taken on board for those long flights. It is easy to apply with no fuss, no mess. I like to let my nails 'go bare' sometimes, but they are an ugly yellow colour. Is there something that I can use to get my nails looking healthy again? There are many things that can discolour nails, for instance, using harsh household cleaners can be a leading culprit. Be sure to use gloves and keep those hands and nails protected from chemicals. A little secret I use is to apply the peel of fresh lemon or grapefruit to discoloured nails. The citric acid will help remove the yellow colour from nail surfaces. Also, use our special 'non-yellow topcoat' on your next manicure to help prevent the nail colour from turning. Special ingredients help protect nail colour from harmful UVA/UVB rays. Think of it as sun block for your nails and ladies, please, whether you're washing dishes, the dog or the car, put those gloves on. Your hands and nails will thank you! Also remember, your nails are not tools. Do not use your nails in place of screwdrivers, pliers or wire strippers. No matter how tough you think your nails might be; nothing is more likely to ruin a perfect 10 than using them as a paint scraper.